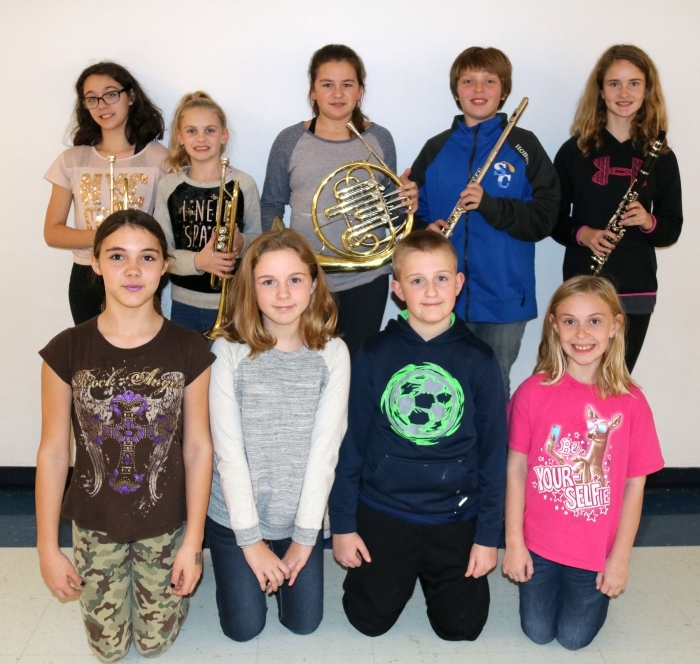 Nine students from Sandy Creek were selected and participated in the Oswego County Music Educators Association (OCMEA) All-County Band and Chorus Festival held this past weekend in Hannibal. The students earned the privilege following an audition and recommendation by their music teachers. They joined with the top musical students from around the county for the annual festival. Pictured in front kneeling, left to right are chorus participants: Andora Reid, Piper Phillips, John Darou and Elizabeth Dano. In back are band participants: Harley Petrie (Trumpet), Abagail Balcom (Trumpet), Madison Darling (French Horn), Elizabeth Hobbs (Flute) and Sophie Harris (Clarinet). The participants are band students of Valerie Marshall and chorus students of Sandra Kinney. The students performed under the direction of guest conductors during the festival and held a concert for family and guests on Saturday, Nov. 3.